A Noise Within is now enrolling students in its Summer With Shakespeare five-week Pasadena summer camp, June 15 – July 17 (Monday-Friday 10am – 4pm) for youth aged 6-18. This conservatory-style program of acting, improvisation, stage diction, text analysis, kinetic exercises, and stage combat is led by classically trained, professional actors, choreographers, and designers. Visit www.anoisewithin.org for complete details. Long Beach Shakespeare Company opens Mark Twain, Is He Dead? Friday, April 10 for ten performances. Carl Wawrina returns in this one man show in which Twain discusses who wrote Shakespeare’s plays and reminisces about his life on the Mississippi. No matter which side of the authorship question you’re on, this will be a humorous and thought-provoking presentation. www.lbshakespeare.org for more information. 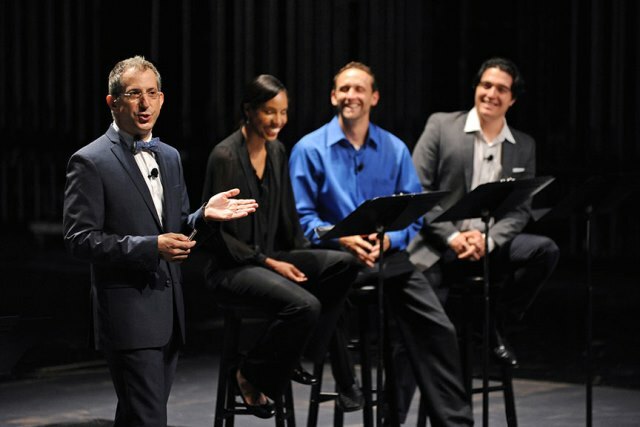 Artistic Director Barry Edelstein will offer an encore presentation of Thinking Shakespeare Live! at The Old Globe on Saturday, June 6 at 11:00 am. The 90-minute event is an exploration of Shakespeare’s language led by Edelstein based on his book, “Thinking Shakespeare: A How-To Guide for Student Actors, Directors, and Anyone Else Who Wants to Feel More Comfortable with the Bard.” Three classical actors will assist during the presentation which is an ideal introduction to Shakespeare for families and young audiences. Tickets and information: www.theoldglobe.org. Two weeks later, The Old Globe will kick off its annual 2015 Shakespeare Festival with Shakespeare’s charming comedy Twelfth Night, running June 21 – July 26. The Comedy of Errors, directed by Scott Ellis, opens August , and Cole Porter’s Kiss Me, Kate, about the backstage shenanigans of a touring company of The Taming of the Shrew, opens July 1. Great roundup of all the news!